The Respiratory Therapy program held their first open house April 30 in the Health Sciences Annex. The program’s current students initiated the idea of an open house so that applicants, pre-program students and family members could see what a respiratory therapist does everyday. 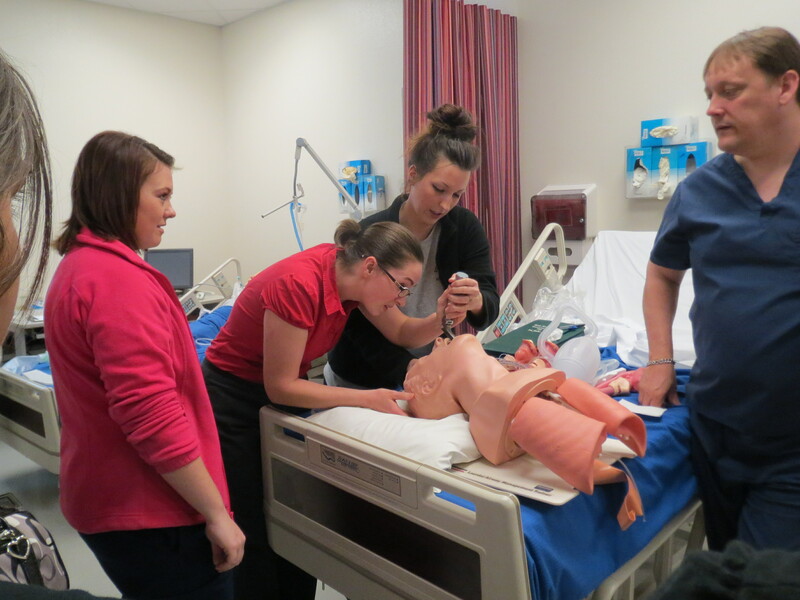 (Left to right) Kayla Jarman, Katie Johnston, Lisa Mace, Edward Benton, Learn to preform a procedure on a manikin. Attendees had the opportunity to watch various procedures and talk to the program director, professors, and students. Katie Johnston, one of many applicants in attendance, watched current students perform an intubation on a manikin and then jumped in and tried the task herself. She was successful on her first attempt and delighted in her accomplishment. Although Katie outgrew her asthma when she was 19 years old, her six-year-old son has respiratory problems that require a nebulizer. She said helping people breathe and enjoy their life are issues very close to her heart. Lisa Mace, a current student in the program, entered the program for an entirely different reason. Respiratory Therapy is one of the fastest growing health related occupations. The U.S. Bureau of Labor Statistics estimates a growth rate of 28% from 2010-2020, which is twice the 14% average growth rate expected for all occupations. This year, 24 applicants will be accepted into the two-year degree program that starts in August. Currently more than thirty people have applied for those positions. For program advisement, call 405-733-7361.